In another thread I mentioned that I'm going to drop my turnouts into the boards as modules. Here's how I'm doing it. 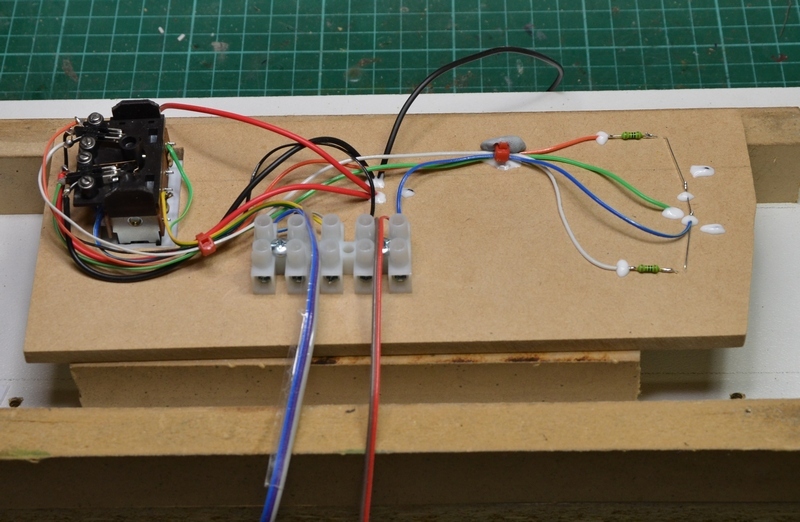 First, I need a piece of 6 mm MDF (which is the same as the top layer of my board), I'm using the Peco PL 10W low current turnout motors and a PL 15 double pole double throw (DPDT), switch to switch the frog on my Code 75 electrofrog turnouts. First I mark out the board.
. . . and then check that the turnout fits. As the instructions for the PL 10W say make a 24 mm x 40 mm hatchway, I drilled out a clearance hole using a 24 mm spade auger bit. It's important to drill from both sides to prevent breakout damage. 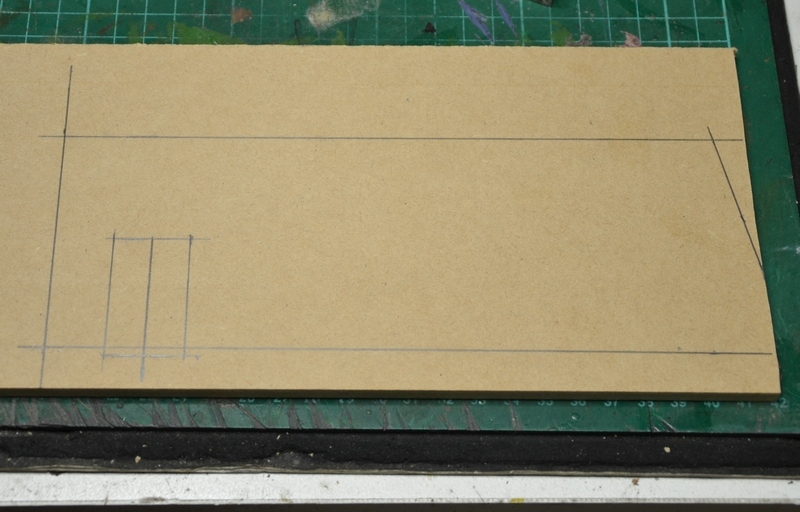 Here we see the hatchway has been cut and the angled end has been cut to match the toe end of the turnout. 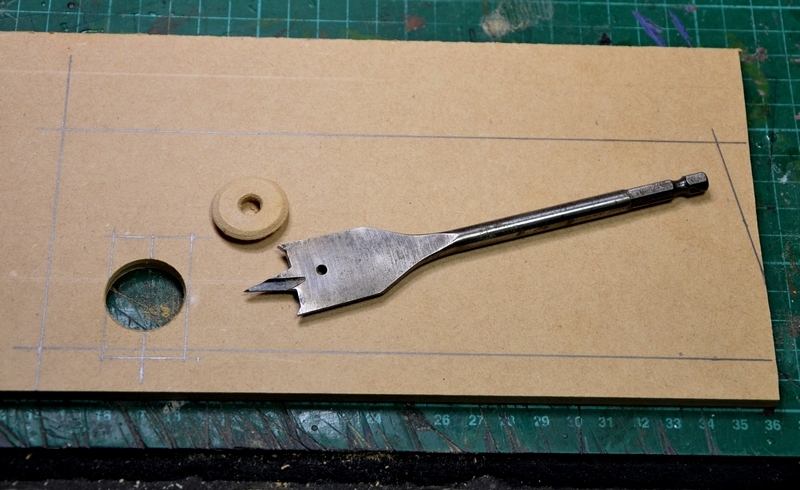 The hatchway was cut using a jigsaw and tidied up with a file. After bending the middle pins (OO/HO only), the next job is to glue the plastic mandrel on to the actuating pin in the motor. There are two important things to remember at this stage. ONE Keep the end of the pin facing down when the CA glue is applied. Do not turn the motor upwards to look at the drop of glue. If you do, the glue will run back down the pin and on to the motor shaft, welding it to the inside of the solenoid. At this point, drop the motor into the bin and get another one out of the box. (How do I know this? ). TWO When you push the mandrel on to the pin, do not push it past the coil frame into the gap, as it won't be able to move laterally enough to operate either the throw bar or the switch, (Also ). Now fit the motor to the turnout and then assemble the switch and clip it on to the motor. You can see that I have cut the wings off the switch frame and trimmed the corners to help with sliding the assembly through the hatchway. It's important to set the switches in their wide open positions before you clip the frame on to the motor to protect the delicate working bits. 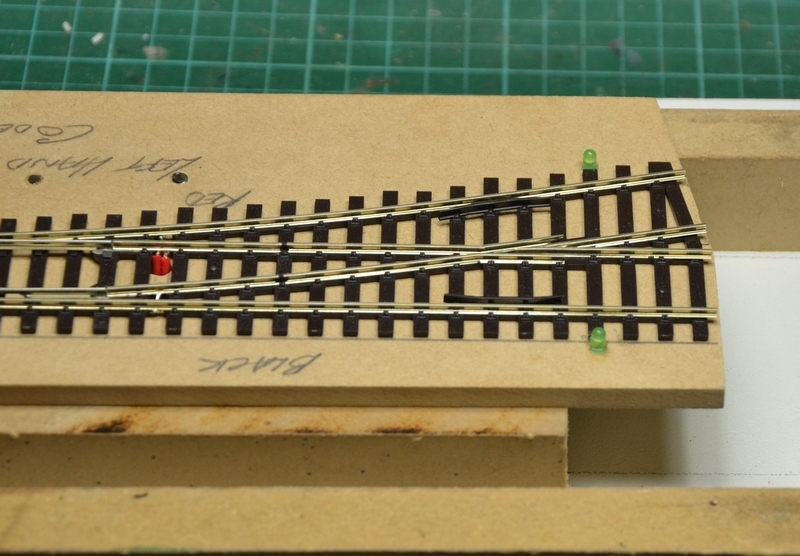 Make sure you remove the little bridging wires. Solder two droppers into the spaces between the ties, making sure that they are soldered on to both rails on each side. I like green for frog wires, so I cut the wire on the frog back to about 5 mm and soldered on a green wire. Turn the turnout over. 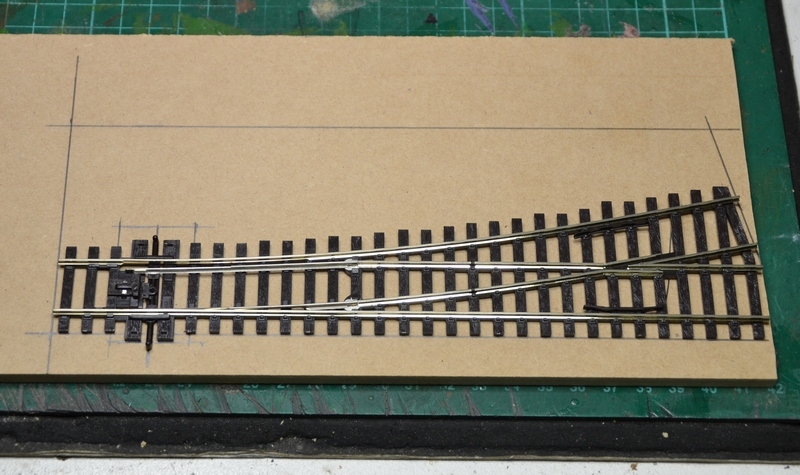 I've inserted .5 mm styrene under the track to help with ballasting later. I made a jig to help with the assembly. 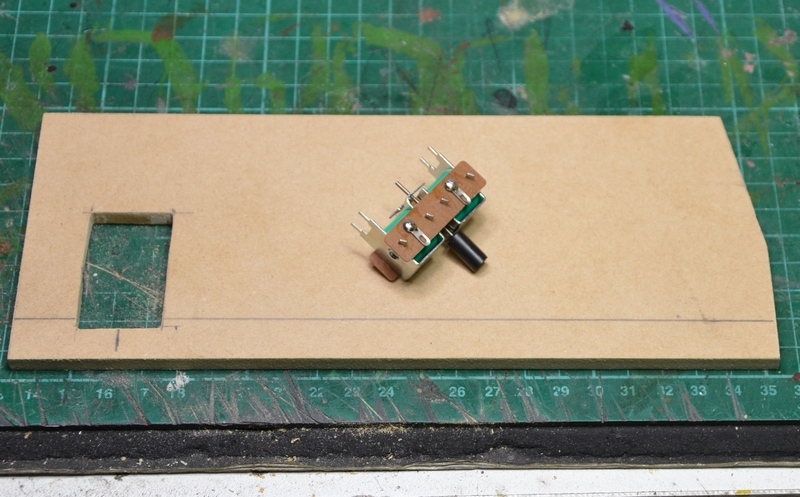 The sides of the jig are the same size as the gap under the board. Four track pins are used to hold the turnout firmly in place. I drilled a .75 mm starter hole in the board and then drove them in with a tack hammer. The pins are then bent over underneath and locked with PVA glue. If I need to lift the turnout later, the pins can easily be snipped off and withdrawn. Once the changes are made, a fresh pin is driven in, bent over and re-glued. The solenoid wires are at the bottom, so it makes sense to do them first. 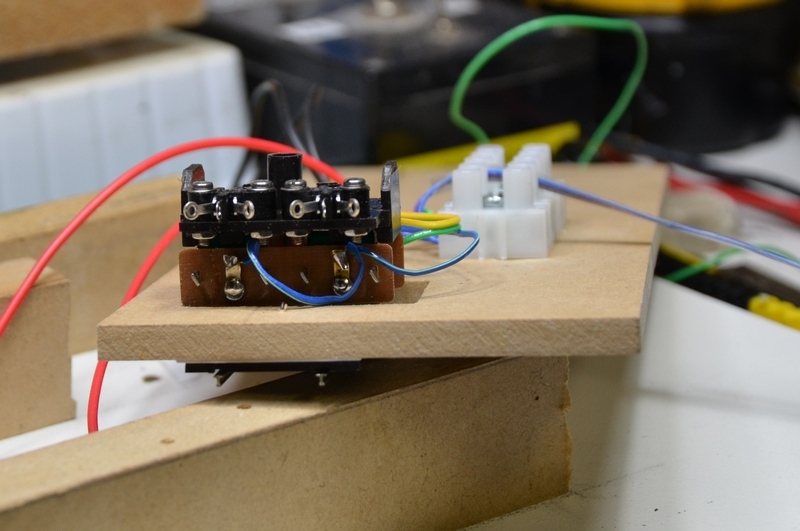 On one side the solenoids are linked as a common. I like blue for common. 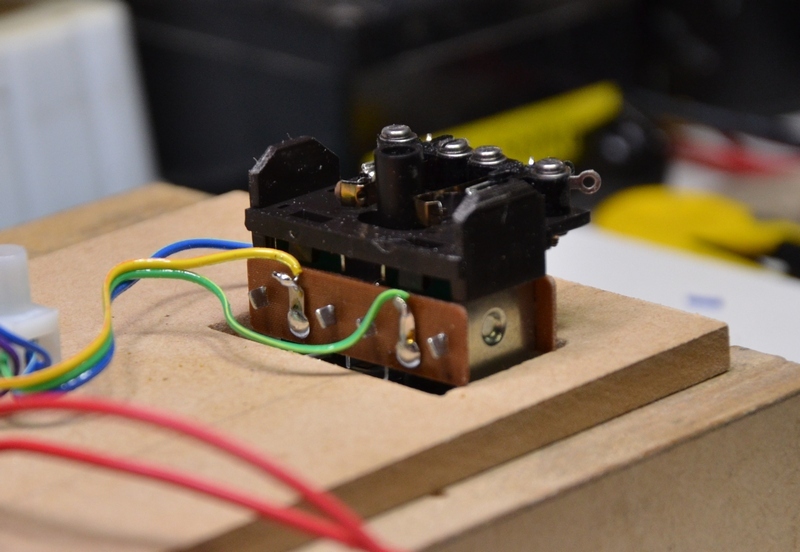 On the other side, each of the solenoids has it's own wire. The droppers for these wires will all be blue/purple/grey, but the top ones can be any scraps of wire. Next level are the frog switching wires. 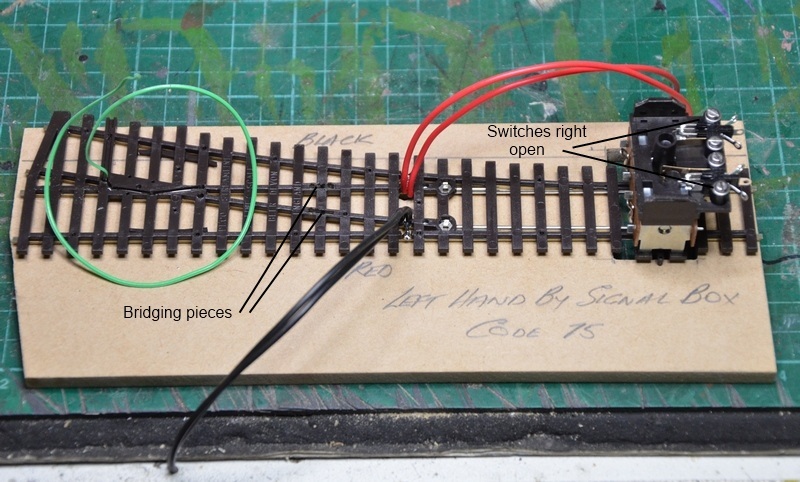 The green goes to the centre of the switch and the red and black track wires go to the outside connectors. It's at this point that the switches are adjusted to their operating positions. I've found that putting the moving end in the middle of the arc usually sets them up right to throw from side to side as I flick the throw bar. It's at this time that the frog polarity is checked using a continuity tester (buzzer). If it is back to front, it's easy enough to unsolder the red and the black and swap them over. Now I'm deviating from the norm a bit. I've fitted two green LEDs at the toe end of the turnout. These are just so I can see the turnout position from a distance when I'm programming RR&Co. Sorry about the depth of field. I should have focus stacked it. Anyway, you can see that I've connected the two long legs (+) to a blue wire, and the two short legs have 1 k Ohm resistor attached to them. I could have used a single resistor on the blue, but from force of habit doing decoders, I put separate resistors on the (-) legs so I can vary the brightness if necessary of the various LEDs on the locos. There are two light gauge droppers from the DC 12 Volt reg power bus. The blue wire is connected to the red and the brown is connected to the centre pin on the second switch. 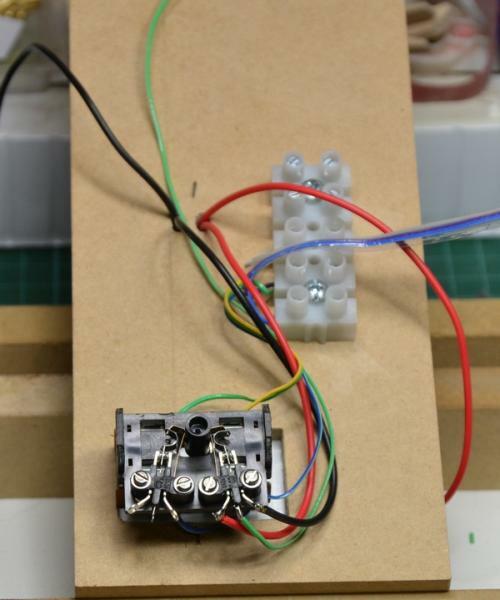 The two wires coming from the (-) legs of the LEDs go to either side of the switch. The terminal block doesn't connect the wires. They are soldered together and then anchored in the terminals for strength. Now to put it on the test machine. As I have ten of these to do, I made up a tester from bits of junk I had around. It has a 12 Volt power supply for the LED power and three leads from an internal CDU for throwing the solenoids. One way . . .
. . . and then the other . 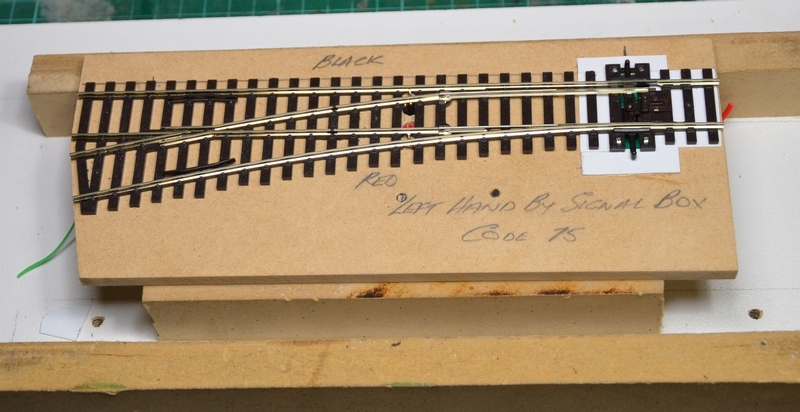 . .
PVA glue to lock the pins and to anchor the wires and other components. If the green frog wire breaks off due to rough handling, it is a real pain to fix it. 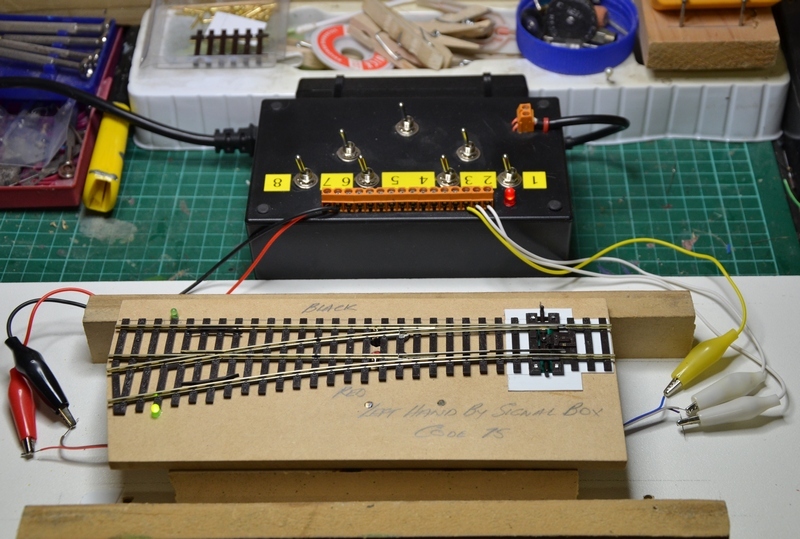 An excellent 'How To' Max and certainly a new way of wiring and installing points & motors on the workbench without having to crawl around under the layout. Many thanks. This one has definitely got to go in the Forum Index for future reference. When you dop them in, how are you going to stop them falling all the way through? Wooden strips or something under the main board? Great account of your work on these points, Max. 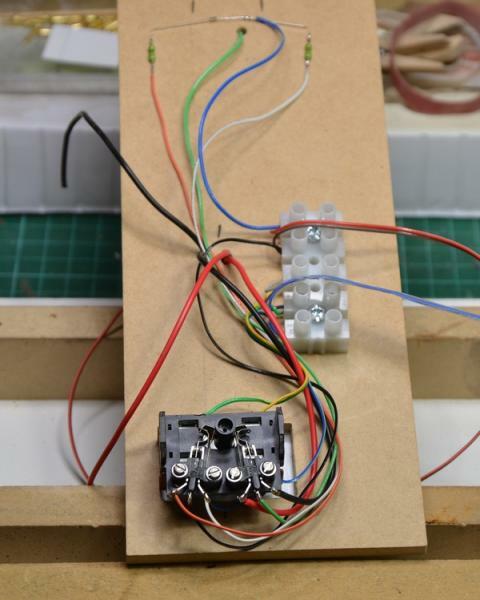 Whilst I have not built up individual points on their own boards, I have nearly always assembled the point motors onto them and wired them before laying onto the baseboard with the rest of the track. excellent Max.very inspiring.pity i've done all mine. There will be a lip about 1 cm wide around the hatchway that they drop into, Warren. Enough to use countersunk head screws to hold them firmly in place. I've still got two more to do to finish them all, but maybe I should do another thread on mounting them, as others have asked the same question. The tightness of the mandrel depends on the accuracy of the cut at the end of the pin, Geoff. They say in the instructions to glue them on. Some of mine fell on (and off), and some had dags on the ends of the pins which I had to file off to even get them on. Despite getting bad press from my mates, I've actually found them both to be well made and strong when they are assembled. The DPDT switches were very impressive. Plenty of adjustment and with the captive nuts, easy to fine tune. Time will tell, I guess but I'm growing in confidence. Max that looks like a well organised workbench. On edit, the above was for zedcell who did ask the question about Cobalts & bi-coloured LEDs & then while I was preparing an answer, he editted his post & removed the comment about Cobalts. 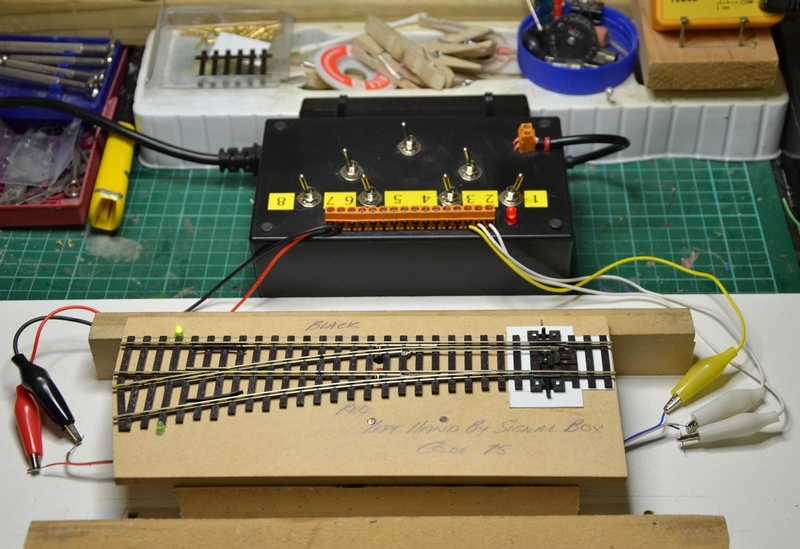 Nice work Max, another inspiration for my future layout, thanks! What a wonderful workbench and associated area Max; to say I am impressed would be the understatement of the year! (The "how-to" is pretty good too!!!!! ). You will no doubt be relieved that the job is done Max but you must also feel pretty proud of your achievements. They are functional, they're easily accessible for maintenance and they're extremely neat. Thanks for an excellent, fully detailed "how to". It will become one of my reference works. 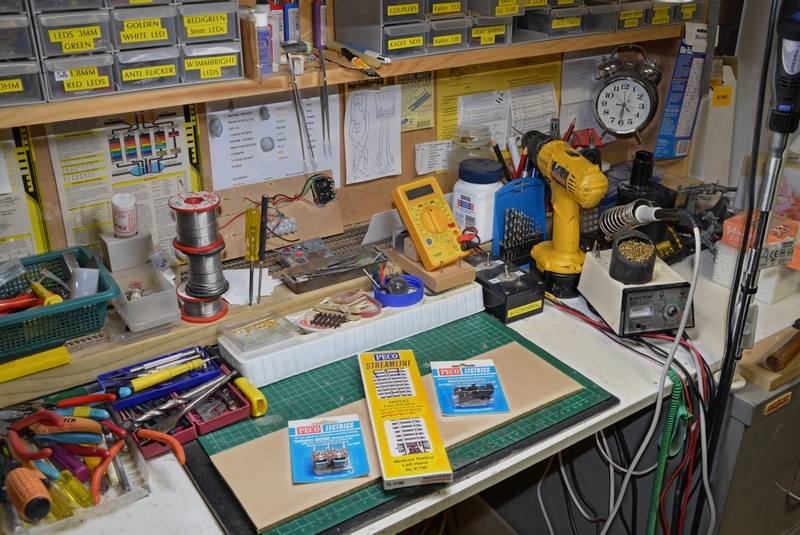 You are here: Your Model Railway Club > More Practical Help > Members Projects > On Members Workbenches. > Drop in turnouts.